Sometimes Intuition Hits, Knocks, or even Burns. I don’t know about you, for me it’s never subtle. Which brings me back to my Intuitive Hit that knocked me off my bicycle! Riding along the bike path on a recent Hot summer afternoon, I felt a surge of energy run through my forearms and a burst of light flood my eyes. Fortunately the bike path has friendly riders because I had to suddenly stop and get off my bicycle. Fortunate because otherwise I would have caused a bike crash! It’s like that. Intuition hits are spontaneous. I haven’t found a potion or spell to conjure Intuition upon demand. In fact, what I have found true, is that Intuition usually Hits when I least expect it. You know, like when you lose your car keys, you find them when you’re NOT looking for them. Or the lyrics to a song you choose to remember come to you in the middle of the night. Why am I going ‘there’? Intuition Hits an ‘open’ mind, not cluttered mind. My mind usually quiets down when I’m physically engaged in an activity like bicycling or gardening. I Love those times when my mind falls into rhythm and I’m quiet inside. Funny how fast breathing and thumping heart beat are quieting. It’s the rhythm that calms me. Thwack! another Intuitive Hit! bops me on the side of my head, knocking me off my center or what I thought was center–only to find I have a much wider center. 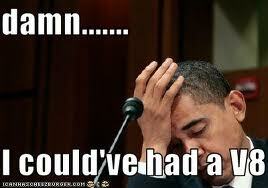 “I could of had a V8!” With a knock on the side of the forehead. I was proven wrong the other day. I had to let go of what I thought was holding me up. The Intuitive Hit that knocked me off my bicycle. Until recently, I believed that we move into the empty spaces. I found myself waiting. Waiting for empty spaces. Have you noticed lately there are over 7 billion of us on this planet. Waiting for empty spaces means waiting and watching your life pass you by! Waiting for empty space to appear is like waiting for an empty lane during rush hour traffic! I’m gonna be chewin’ on this one for a lifetime! How can I ‘see’ or experience an empty space inside me? As a long time ecstatic dancer…stillness…is the last of the 5 Rhythms. Flowing, staccato, chaos, lyrical and then stillness. My stillness shows up after a ‘hard’ dance. After sweat and tears. After moving a lot OUT of my system, I might experience a brief moment of stillness. 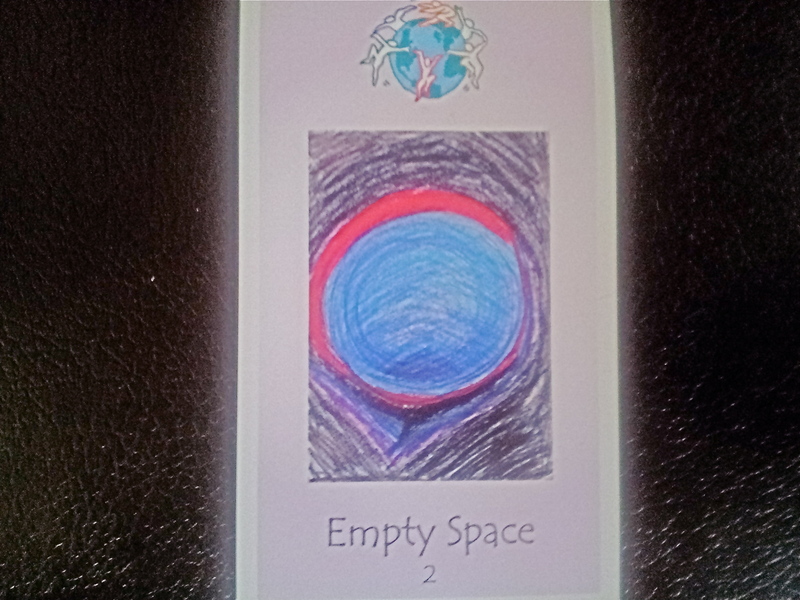 In my 22 card Tarot Deck that I created-the second card is Empty Space. My higher self knows of this, yet my ‘lower self’ has no clue. In an altered state I ‘download’ poetry about Empty Space…make a simple alter with empty space on it…pause briefly in between sentences when talking…yet I feel unacquainted with feeling Empty Space from the INSIDE – empty space Inside Me? Hmmm…Isn’t that called ‘Space Cadet’? Owch! “Move into the empty spaces INSIDE your heart, mind and Soul. Create invitation-instead of waiting to be invited.” Ohhh…I’m starting to get it. I remember going to high school dances. I didn’t stand along the wall waiting for someone to ask me to dance. I grabbed a nearby girlfriend and jumped into the middle of the dance floor. I didn’t wait for a guy to ask me out on a date. 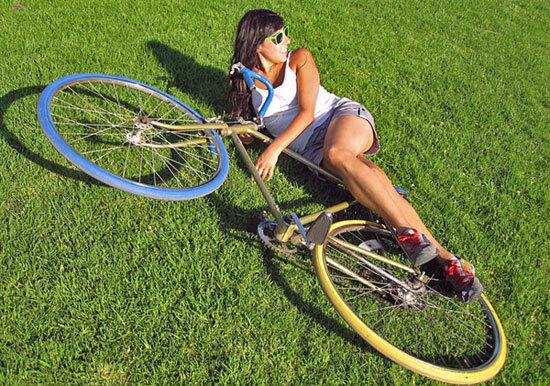 I would invite a male friend to join me on a bike ride -or picnic. Waiting to be invited feels vulnerable. As a teen-ager it felt ‘stupid’ (clear sign of arrogance). Why do girls wait for invitation and boys initiate? As an eager young adult I didn’t wait for empty spaces. I assumed spaces were empty until I stepped into the middle of the scene. Where did that attitude go? It sprouted with the Harmonic Convergence and continued to grow into the early 90’s. 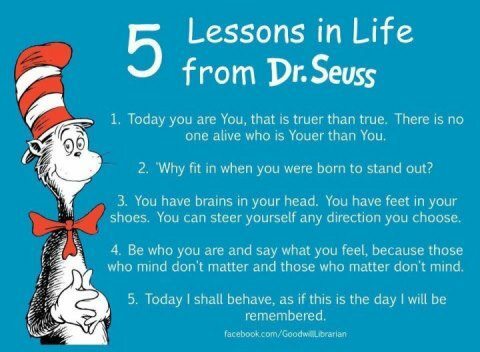 It’s what I learned in the New Age Manual on How to be Spiritually Enlightened! For example on a summer day in 1992, I rented a horse to ride along the Oregon Coast. I gently nudged my horse to go, requesting it’s permission to ride. The horse stood still. I sat on the horse going nowhere. My friend rode off. I petted the horse visualizing us riding along the beach. The horse didn’t move a muscle while I meditated a fun ride. While I waited to move with my horse, my friend had fun riding his horse. I didn’t have fun sitting on my horse. The New Age taught me to be un-attached to outcome. Move into the empty spaces…so you don’t make waves. I thought spiritual was gracefully waiting and desiring nothing. Following these directions kept me ‘waiting’. And while I’m waiting-empty spaces disappear. FAST! Intuitive HITS don’t wait for the ‘right moment’. Intuitive HITS don’t wait for an invitation. Seize the moment and be open to receive guidance. I’m learning that it’s while I write, words come to me. It’s in the practice of being engaged that I’m open to inspiration. Like in volley-ball. Even when the ball isn’t coming to you-you hold a posture ready to receive the ball. You’re in position, open and vigilant, watching the ball. I learned in Yoga the engaged yoga position. I was standing there ‘waiting’ for the next yoga pose called by the instructor. I was standing, more like slouching comfortably. She said “be engaged’. Standing relaxed I looked at her. She walked up and stood next to me. I didn’t get it. She was demonstrating being engaged by just ‘standing there’. I ‘stood’ shoulders drooped, back curved, hip to the side waiting for her to-Instruct me. Wow! I felt my body open wide. My breath deepened. My mind quieted down. I could actually feel my joints and muscles get oxygenated. Empty space on the inside. Full of presence. I’m not waiting, I’m participating in this very moment. It’s never too late to experience the moment, unless you’re waiting for the empty space. Intuitive Hit scores Home Run! Woman Seizes Opportunity and Runs for It! 90 Minute Session for $60.00. Intuition Counseling helps you listen and respond to your own inner guidance. Unsteady, wobbly, shaky? Your higher self is requesting attention. My sessions are intended to sharpen your own tools for self discovery. I live simply in Southern Oregon on my friends’ amazing sanctuary. Surrounding me are gardens, animals, wild nature, and a wild dance community with open hearts. My lifestyle weaves ritual, presence, authenticity, integrity, art and movement.I am an author of 2 self-published books: SENSUAL EATING, and SACRED DANCE with 22 Card Tarot Deck. I hold a Masters degree in Transpersonal Psychology and Bachelor’s degree in Nutrition. I am Co-Founder of Body Choir Ecstatic Dance established 1994 in Austin, Sante Fe, Ashland, Medford. You can pay for your Intuitive Counseling through Pay Pal. Previous How Do I Trust My Intuition Right Now? I have a question regarding the empty spaces conversation that you’ve started here. My question is regarding the seizing the moment vs, waiting in a state of non attachment as you worded it. The teachings I’ve been most drawn to do talk about staying in one’s center, non attachment, and my understanding of it is that one is not attached to the meaning of what it is that feel called to do. But I do also agree that there is an engagement with life that is a prerequisite. So I ask you, and the guides, what is the difference between waiting and “non action”? Hi Rossi, Your Question is GRRRRReat! What is the difference between waiting and “non action”? Funny how the two definitions seem so similar. I DO feel a difference between the two words. Waiting is related to time. The tick, tock measured time. Non-action implies time out of time…a pause. For me, waiting requires patience cultivated by a Strong Spiritual Practice. Non-action has a flavor of acceptance-grace-ease. Little attachment to outcome. If I am waiting, I just filled the empty space with waiting. Probably I am attached to “When am I going to Stop Waiting?” Almost like holding my breath. This brings me to an even deeper inquiry. What is the difference between Acceptance and Tolerance? The Intuitive Reading I did yesterday was about this. To address your question-I think Acceptance is Non-Action, and Tolerance is Waiting.